This article is originally inspired by a rather insightful video discussing the interplay between safety management and quality assurance. A management system is a set of processes used to manage “findings” during operations. How findings are made and how follow up is facilitated depends on the process being used, such as safety management or quality assurance. Is in line with compliance requirements. With quality assurance, findings are generated through such audits and/or inspections. After the finding is processed through the management system, management will need to follow up and review the issue to make sure that the corrective action(s) corrected the problem, and that operations are operating within expectations, compliance, and an Acceptable Level of Safety. Safety management rests on employees’ submitting reports through the hazard reporting system. These reports identify a “finding,” or safety issue, that needs to be corrected. Root cause analysis will include further elements of analysis, such as Human Factors. The reporter and relevant employees should be notified that the issue has been corrected. Safety managers handle both safety and quality by managing safety issues and performing audits. In your organization, these processes should be similar in actual practice. In smaller safety programs, it makes sense for safety managers to handle both safety and quality assurance. 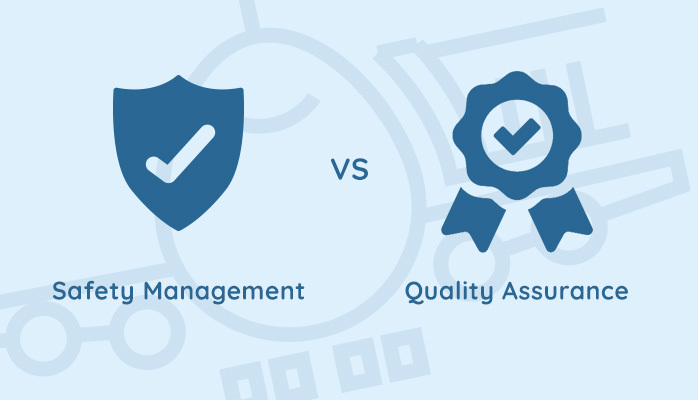 In larger organizations, it may make sense for a separate entity in the company to management quality assurance operations, but only so long as both are following the same underlying management process. The video and the ideas in the video are interesting in that they identify an underlying management system that is common to safety management and quality assurance. This is very useful for helping you understand your difference processes. The video does not mention that follow up is the same for both safety management and QA in terms of updating the SMS if changes are made to the SMS.